Qeridoo fahrradanhänger kaufen? Wir bieten Sie alle Modelle an Qeridoo Speedkid, Qeridoo Sportrex, Qeridoo, Qeridoo Kidgoo oder Qeridoo Jumbo .... wir haben alles. Überprüfen Sie die zusätzliche passenden Produkte für ihre Qeridoo kinderanhänger wie den Qeridoo Fahrrad Kupplung oder Qeridoo Regenschirm aus. Qeridoo trailers There are 3 products. 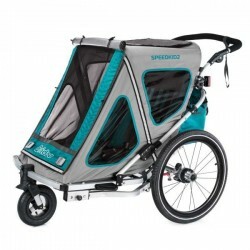 Aluminum bike trailer in sporty look with darkened panoramic roof for one or two children. Very small fold size (25x71x89cm) and fits almost in every car trunk. Child bicycle trailer for 1 child is narrower and fits through every door, every corridor and every shopping street. A single-seater is more manoeuvrable and more agile in motion, as it resembles the characteristics of a baby stroller. Child bike trailer with walking function, suspension and large trunk. The trailer can accommodate two children.